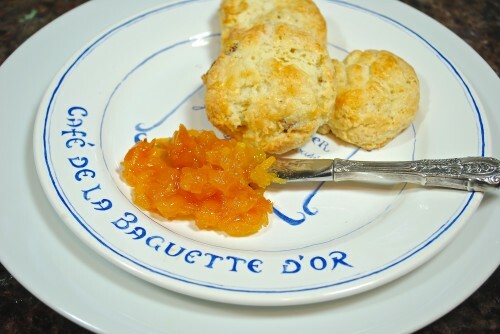 Delicious scones and great marmalade. I decided to do the duck appetizer over the holidays and wanted to try Thomas Keller’s marmalade recipe. You’re have to wait until Christmas for the duck appetizer but for now, here’s the Tangerine Kumquat Marmalade recipe. Recently I found some fantastic little (or big) Weck brand jars at one of our local gourmet grocery shops. I love them, they have rubber rings and instead of the normal screw tops, they have clips that hold down the lids; so retro looking. You can find these online at Amazon, Crate and Barrel, or to to www.weck.com to order them. I have never been a toast and jelly kind of person. 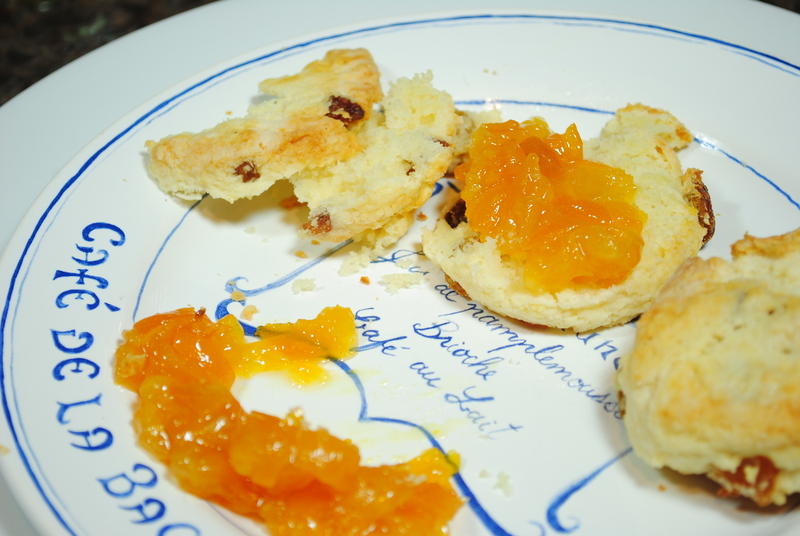 Strawberry jam, even though it isn’t a favorite of mine, is a must for freshly baked Cream Scones. All kids and adults probably love peanut butter and jelly. Not me. I’m strictly a peanut butter and bread type of person. 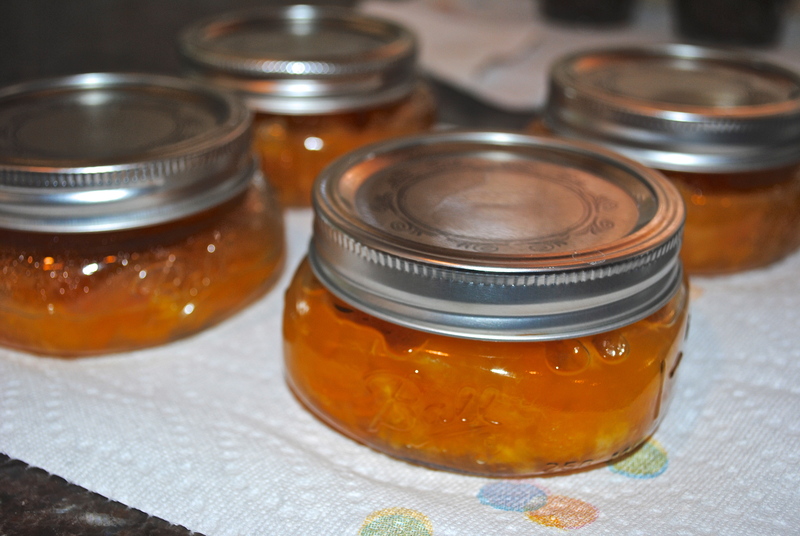 A couple of years ago I did make some wonderful peach preserves. Aren’t preserves so much better than jelly anyway; you get those bits of fruit and rind that give it so much more intense flavor. Some habanero peppers even got slipped into a few jars of the peach preserves for some extra kick and was fantastic on top of different types of cheeses. 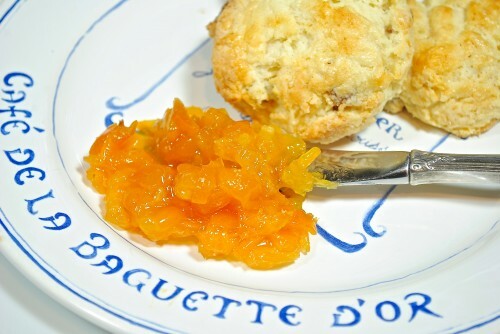 I just had to try some scones with this jam but you can try it on any type of bread, put it on a cheese or even incorporate it into some recipe. A beautiful marmalade that can have so many uses. If you are interested in the difference between a marmalade, preserves, jelly, jam, look here. BLAST FROM THE PAST: If you haven’t already tried this Sugar Plum Cake you need to make it for the Christmas holidays. It’s the best and I’m sure your family will love it. If you make it and like it, please leave a comment at the bottom of that page. I finally found kumquats. Guess they are not available until December. 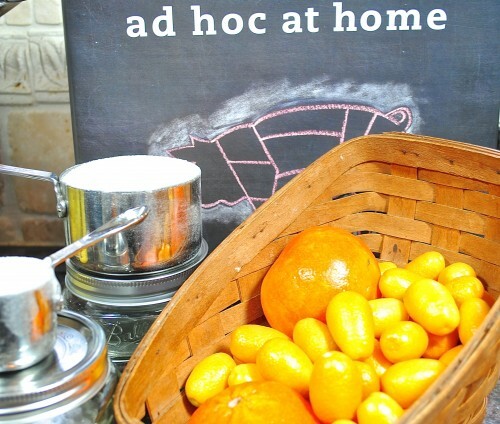 Cut kumquats in half lengthwise and then soak in water for 18-24 hours. Blurry picture but not too blurry to see all the seeds in the tangerines. Remove seeds, squeeze juice and chop pulp. You can refrigerate the pulp and juice together until the kumquats are ready. 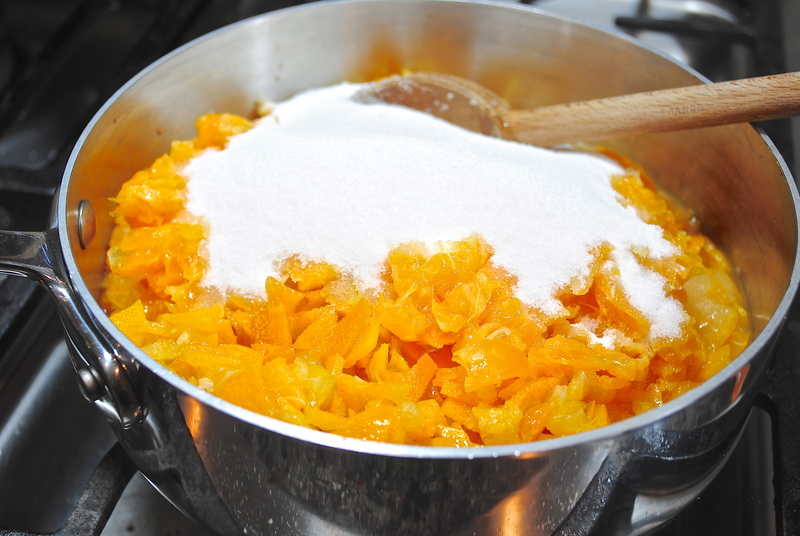 Cook the chopped kumquats, tangerine pulp, and sugar until reaches 210°-220°. That took about 20 minutes. Cooking, cooking, cooking. Don’t get impatient. Spoon into hot jars and seal. After putting marmalade into jars wipe rip put on lid and screw top. 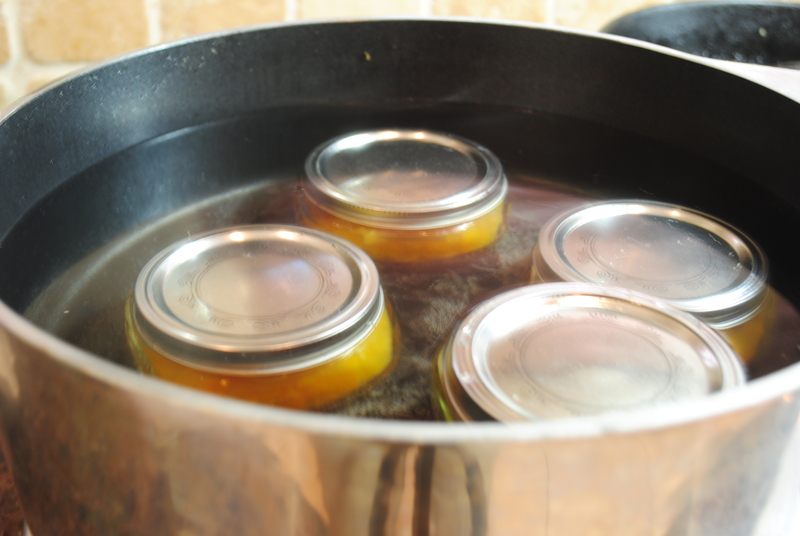 If jars are hot and mixture is hot it will probably seal. I didn’t want to take a chance so I processed mine in hot water for about 10 minutes and they were sealed so they could go into my pantry. Cut the kumquats lengthwise in half. Remove all the seeds and the small stems. 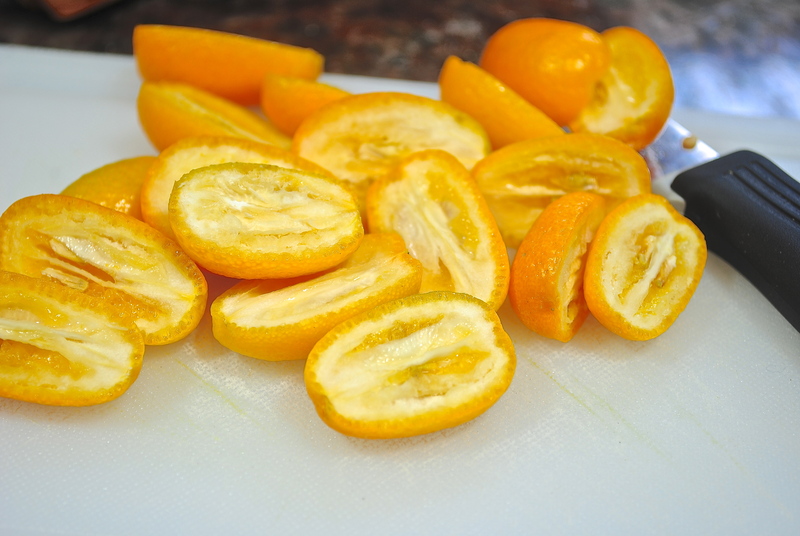 Put the kumquats in a large bowl, cover by 21″ with cold water and refrigerate for least 18 hours or up to 24 hours, to remove some of the bitterness from the rind. Drain the kumquats and return to the bowl. The halved kumquats are the right size for serving the marmalade as an accompaniment to meat or cheese. 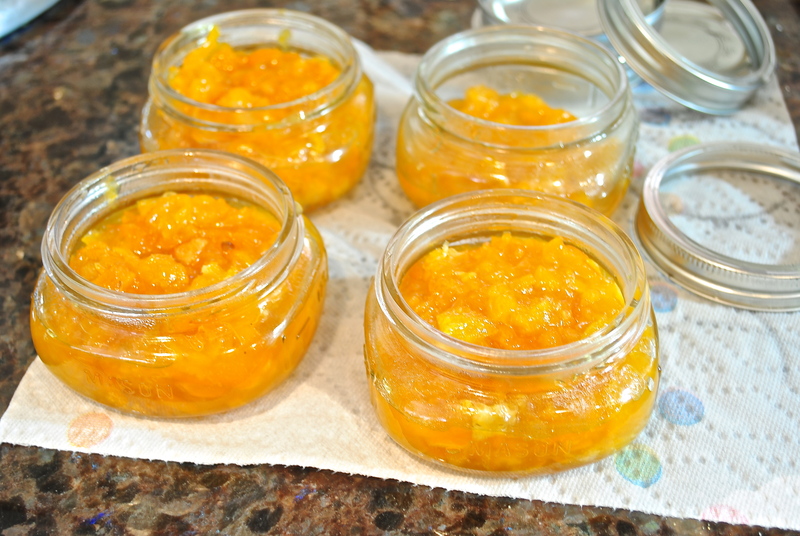 If you will be using the marmalade to spread on toast, cut the kumquats into smaller pieces. Quarter the tangerines, reserving the juices. 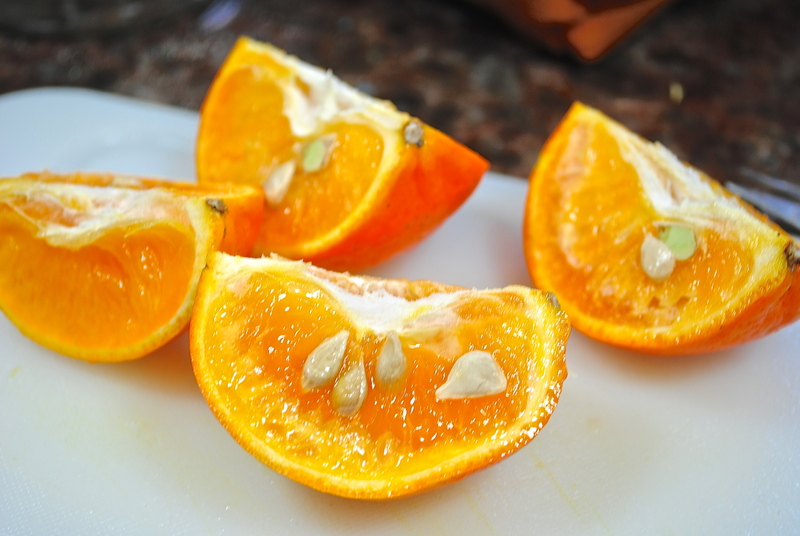 Cut the flesh of the tangerine wedges away from the pith and the skin and remove and discard any seeds. 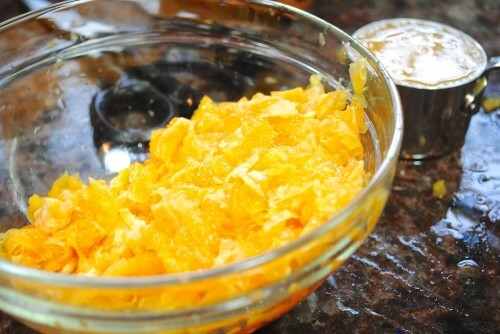 Squeeze the juice from the tangerines into a measuring cup and add the juice from the cutting board. Set aside 1 cup of the juice for this recipe and reserve any remaining juice for another use. Spoon the marmalade into a jar or other storage container. Cover and let cool to room temperature, then refrigerate for at least 2 hours or preferably, for 24. 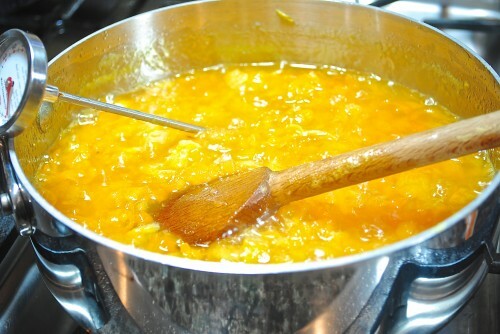 The marmalade can be refrigerated for up to 1 month. Makes about 2 1/2 cups. *Note on plate testing: To check that compotes, jams, and jellies are at the right consistency, put a tablespoonful of what you’re cooking on a plate and chill it in the refrigerator for 10 minutes. If it is too thin, return to the heat, cook a few more minutes, and retest. Mix the dry ingredients. Using your fingers or a pastry blender, cut in the butter until they resemble small pea size pieces. Mix egg and milk and add all at once to dry mixture. Add raisins. Mix and pat out into a square or circle. Either cut in squares or use a small biscuit cutter (whatever size) and cut into circles. Put on cookie sheet. Brush the tops of the scones with cream. Bake at 400° for 12-15 minutes. Freezing directions: If you want to freeze for the holidays. Cut and brush tops with cream. Put on cookie sheet and freeze until firm then put into Ziploc bags or plastic container. When you are ready to bake — turn oven on 400°, remove scones from freezer and place on cookie sheet. When the oven is preheated, put your partially thawed scones in to bake until golden brown.